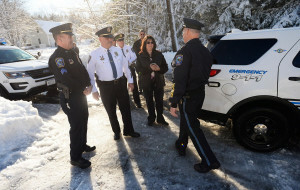 Members of the Saco Police Department wish Chief Brad Paul well after escorting him home after his last shift Friday. Left to right are Sgt. Bruce Cote, new Police Chief Raynald Demers, Court Officer Tammy-Jo Girard and Chief Paul.